In 1989, Nissan Skyline GT-R chassis codes - VIN numbers- started at chassis number 54, or BNR32-000054 and went to chassis number BNR32-005083. Although FAST and one other reference differ. Total of 4365 cars paint codes pulled for 1989, and in a huge surprise KH2 dominated with 71.8% of the cars being gunmetal. A distant second was 732, black with 17.5%. Third place - silver only saw 5.4% of the bodies. 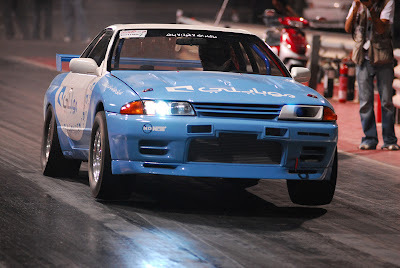 TH1 - or one of two blues that are seen on R32s only showed up on 3.2% of the cars. Last place, but always faster, red with only 1.8% of the cars being red. Even though this list is missing (5083-0054=) 5029 - 4365 = 664 cars, its a pretty good guess at the numbers and percentage of cars in each color available in 1989. R32.4 GT-R at Buttonwillow. First class ride to and from the track from Emergency Hookers. NISSAN SKYLINE Hi! i like your blogs thanks for informations.